From the extravagant mansions of Forest Hills Gardens to the shops and modest co-ops of Austin Street, the central Queens neighborhood of Forest Hills offers nearly every vision of comfortable living, including an easy commute to Manhattan. It is one of the safest neighborhoods in Queens, and it boasts one of the best public school districts in all of New York City. Founded in 1906, Forest Hills is divided into three parts. Beautiful Forest Hills Gardens, built as a planned garden city community in 1909, is the most exclusive address in the borough. More modest apartments, co-ops and condos line the north side of Queens Boulevard. Single- and multi-family homes, developed in the 1920s through 1940s, can be found in the area west and south of Forest Hills Gardens. Forest Hills Gardens is a wonderland of winding roads and magnificent Tudor and Colonial homes. Spacious gardens and greens are the signature of landscape artist Frederick Law Olmstead, son of the designer of Central Park in Manhattan. Property in the private enclave is protected by guidelines similar to those in historic districts. Because of the concerted efforts of residents, the community remains much the same as it did at its inception. Built as a planned "garden city," the Gardens is unique—exclusive, but also a diverse and family-centered community. To anyone interested in the architectural history of the planned "garden cities" of the Arts & Crafts period, Forest Hills Gardens is one of the best remaining examples. Forest Hills Gardens was named "Best Community" in 2007 by Cottage Living Magazine. In southern Forest Hills, Metropolitan Avenue, or "Metro," is known for its antique shops as well as a number of innovative new restaurants. On the north side of the boulevard, the most luxurious high-rise buildings in the area tower over the neighborhood. The most notable of these are The Continental on 108th St, Kennedy House, the Pinnacle, and the Windsor. Northern Forest Hills is a combination of low-rise apartment buildings and single-family homes. Austin Street is the neighborhood's main shopping and entertainment center, with a wealth of upscale boutiques and small shops as well as popular chain stores like Barnes and Noble, Ann Taylor, Gap and Bath and Body Works. Austin Street is especially lively on weekends. Metropolitan Avenue offers more local stores in addition to its antique shops. Forest Hills was, for years, a predominantly Jewish community (which explains the area's 10 synagogues). Recently it has become a melting pot of international cultures including Russian, Asian, Middle Eastern and East European, a diversity that is reflected in the neighborhood's many cuisine options. 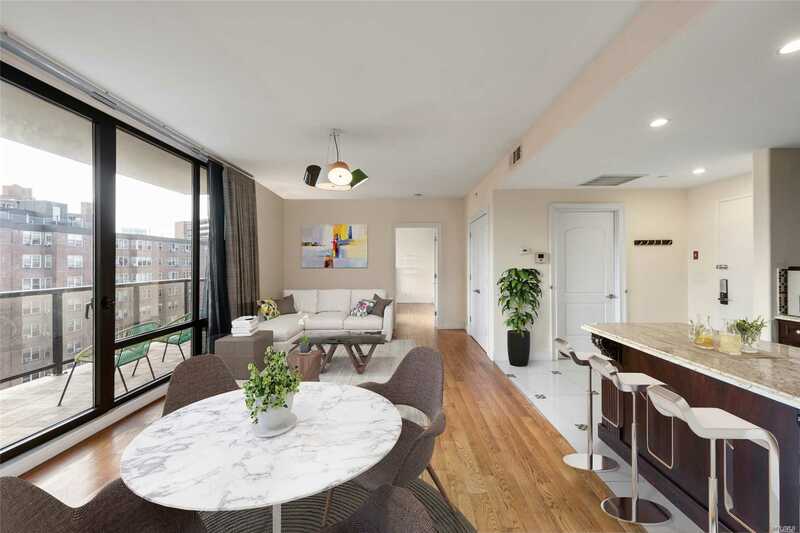 Nearby Forest Park offers walking, biking, horseback riding trails and a golf course, and Flushing Meadows Corona Park with its entertainment complexes, zoo, gardens and museums, is not far away. Getting to Manhattan is an easy commute. The E and F express subway trains bring riders to Midtown in four stops and about 20 minutes. The Long Island Rail Road into Pennsylvania Station is a 13-minute trip. Three major highways are within a mile. With an abundance of shopping, a surprisingly quick commute to Midtown and plenty of attractive housing, young families and couples from Manhattan and Brooklyn are getting wise to Forest Hills. Just north of Forest Hills, Rego Park was named for the first two letters of the Real Good Construction Company, which developed the area in the mid-1920s. In addition to the area's many apartment buildings and multi-family houses, a section of Rego Park known as the Crescents—because of its semicircular streets—contains many colonial and Tudor style homes with slate roofs.